Check out our Large Group Starter Pack for even more savings! FamilyLife's Art of Parenting will help parents find new ways to integrate faith into everyday parenting moments. We can help parents make faith the core of their parenting with intentional, biblical teaching and Christ-centered plans. Parents will end the eight sessions with renewed confidence, fresh insights on parenting children of different ages, and a parenting plan unique to each child's personality and gifting. The eight engaging video sessions feature interviews with parenting experts, stories from parents who share their own experiences, and dramatic clips from FamilyLife's feature film "Like Arrows." 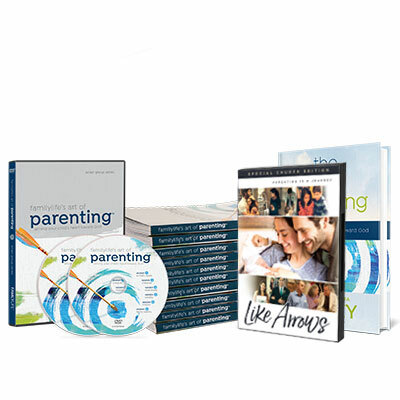 The kit includes a copy of the "Like Arrows" DVD and a copy of The Art of Parenting book. Additional study guides sold separately.